We have been particularly blessed of learning directly from some of the most respected modern yoga masters whom we gladly may call close friends. While not every mentor has yet been to the INNERCITYOGA studio in Genève / Geneva, we try our best to bring this knowledge to you. You may attend the special events that consist of public workshops and the more intimate setting of “Deepen Your Yoga” immersions for serious yogis that are part of the advanced yoga teacher training. With yoga being a path of constant learning, at INNERCITYOGA you may benefit from this rich knowledge when the special guests are in town. Some of the world's most important yoga teachers have been joining us from around the globe. Each and everyone of the special guests are known for teaching yoga their own, very special way. Here is a glimpse of the vibe that they have been sharing during their special events. Alan Finger on the outdoor deck. The original founder of Yogaworks in Los Angeles, Alan Finger is a second generation yoga master who has been practising and studying yoga for over 40 years. Together with his father Mani Finger, he scientifically explored the blend of postures, breathing and meditation that accesses human potential to the fullest, calling it «ishta yoga», the integrated system of hatha, tantra and ayurveda. Annie Carpenter demonstrating Chaturanga Dandasana on INNERCITYOGA founder Ioana. Bryan Kest, a close friend at INNERCITYOGA sharing the love for yoga and movement. Ever since his very first trip to Europe in 2004, Bryan Kest has been at INNERCITYOGA every year. Known for opening the Ashtanga yoga practice to a wider audience with his Poweryoga, Bryan belongs to the world's most popular teachers. Bryan Kest has been practicing yoga since 1979, starting when he was 14 years old.He has been teaching yoga for more than 25 years, turning more and more people on to a healthier, happier and more serene lifestyle.Usually, large crowds gather when he teaches. In Geneva, you o have the opportunity to get the most from him with the number of students limited by the space of the beautiful studio. We are particularly blessed to have Bryan in the inner circle of our family and the family of yogis. leading naturally into a deep insightful practice. From our personal experience we can tell you that Chad Hamrin reads your body like no one else, helping you to deepen your practice. Chad Hamrin is the lead teacher in INNERCITYOGA’s advanced RYS-300 Deep Flow Yoga Teacher Training. A wonderful friendship with Cyndi Lee taking place in Geneva. Cyndi Lee was hosted by INNERCITYOGA on her very first trip to Switzerland, followed by several more. Cyndi is the founder of the OM yoga center in New York city, the largest yoga center in the United States. She teaches hatha yoga in her very own OM yoga style, adding a hint of buddhist philosophy and making it a memorable class. After meeting her root guru, Gelek Rimpoche, in the late 1980s, Cyndi’s practice of yoga and Buddhism merged with her choreography. In 1994, “Dharma Dances” was her last concert, which featured Allen Ginsberg singing his own songs and accompanying himself on harmonium. She said good bye to the dance world and started teaching yoga full-time. Cyndi’s popular asana classes offer alignment based vinyasa with a dharma influence. Every class is different, designed to teach from the doing, and to relate to the very people that are in the room that day. Great energy and fabulous company during David Swenson's visits! Recognized today as one of the world's foremost practicioners and instructors of the dynamic ashtanga yoga, David Swenson was hosted for the first time in Switzerland by INNERCITYOGA in Geneva. David returned several times and again we experienced2 a workshop of yoga, laughter and fun with one of the world's most knowledgeable teachers. He began practicing yoga in 1969 at the age of 13. His older brother Doug was his first teacher. They practiced Hatha yoga from whatever books they could find. David's introduction to Ashtanga yoga came in 1973 when he met David Williams and Nancy Gilgoff in Encinitas, California. In 1975, David and Nancy brought K. Pattabhi Jois to the U.S. for the first time, and Swenson was fortunate enough to be there. Swenson made his first trip to Mysore in 1977. He is one of a very small number of people that have learned the full Ashtanga system as it was originally taught by K. Pattabhi Jois. Some scenic tour yoga with Doug Swenson at Château de Chillon with INNERCITYOGA's Patric. Doug, the elder of the Swenson brothers, began his study of yoga in 1969 ! He has had the fortune of studying with many great teachers including Dr. Ernest Wood, K. Pattabhi Jois, Ramanand Patel and others. Doug is a master yoga practitioner, philosopher and dedicated health advocate. He has incorporated influences from several different yoga systems along with his passion for nutrition and the environment to develop his unique approach. He has authored several books: “Yoga Helps”, “Power Yoga for Dummies” and “Mastering The Secrets of Yoga Flow”. Doug’s classes are inspirational and invigorating and his supportive style of teaching and sense of humor sendS his students home with a smile on their face and a softness within their heart. With over 20 years experience, Joan is E-RYT 500 Hours Yoga Alliance certified, and a dedicated Ashtanga practitioner who has mastered the advanced A (3rd series), which is a high level of achievement. For over 10 years, Joan Hyman was Senior Teacher Trainer at Los Angeles based YogaWorks to become the Director of Teacher Trainings at Wanderlust Studios. She took several trips to Mysore, India to study with the late Sri K. Pattahbi Jois, founder of the Ashtanga Series and disciple of Sri T. Krishnamacharya, the father of modern yoga, and his grandson Sharath Rangaswamy. Since 2015 she travels the world exclusively teaching workshops and retreats. 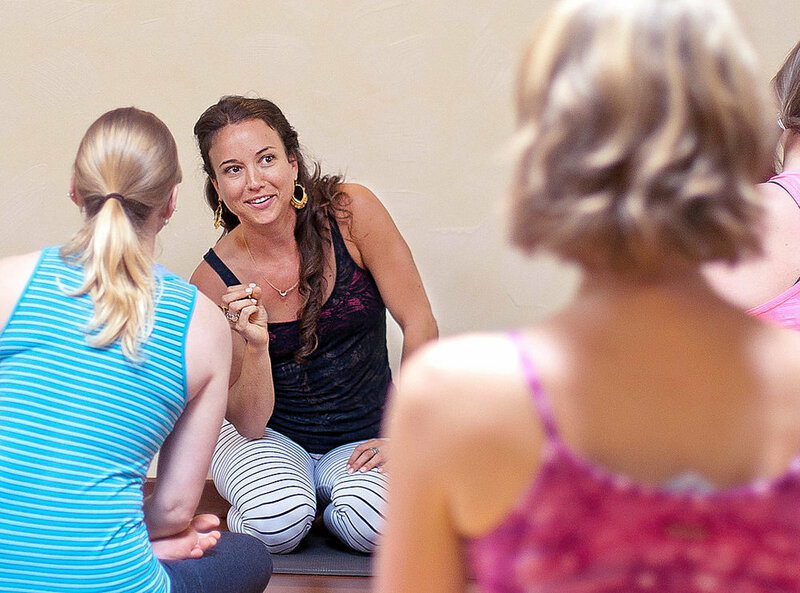 Joan is in charge of teaching INNERCITYOGA's Deep Flow Yoga Teacher Training. She has been leading all RYS-200 hours trainings since 2012 and segments of the advanced RYS-300 Deep Flow Yoga Training. Kathryn Budig was trained under the expert eyes of the original Yogaworks founders Maty Ezraty and Chuck Miller. She teaches regular Vinyasa Flow classes influenced by ashtanga yoga, arm balances, inversions, core work and laughter. Kathryn is playful and accepting in her method of teaching, using metaphors to explain techniques in a way that enables a broad range of students to understand the lessons with ease. Kathryn Budig has been featured in many yoga and health publications and works regularly with the esteemed publication, Yoga Journal. She wrote several books about yoga such as her Aim Tue approach, is a regular contributor to Yoga Journal and other publications and currently co-hosts the Free Cookies podcast on ESPNW. Katy enjoyed a 10-year career as a dancer before devoting herself completely to yoga. She danced across the world with the Royal Ballet and English National Ballet, complimenting her dance career with the power of yoga's movements, breathing and relaxation techniques. This background as a dancer gives her an extraordinary vision into how bodies move and influences her understanding of posture, alignment and energetic flow. Her integrated teaching style involves an eclectic mix of dynamic vinyasa, bhakti yoga, (the heart essence path), structured alignment, philosophy, mantra, sufi poetry and wicked musical vibes. Katy Appleton has been a regular visitor at INNERCITYOGA over the years. With 30 years of experience in martial arts, healing chinese arts and yoga, Matthew creatively links these disciplines together into one single flow, called yoga tai-chi fusion. Matthew developed this method after discovering that even though yoga, qigong, and the internal martial arts each stand alone as great health systems, that something powerful and transformative emerges as the practices join. Together they compliment each other to create a complete practice. This results in a deeply energising synergy where the body gets strenghtened and the mind calmed. It is always a pleasure to host our dear friend Tiffany Cruikshank for her detailed anatomy based workshops and immersions. Tiffany Cruikshank is the founder of Yoga Medicine and began practicing yoga when she was in her early teens. She is internationally acclaimed due to her ability to fuse the two worlds of eastern & western medicine together and apply it to the practice of yoga in an accessible and relevant way. She has been teaching for over 20 years, has a premed Bachelor’s degree in Medicinal Plant Biology and a Masters in Acupuncture & Oriental Medicine with a specialty in Sports Medicine & Orthopedics. Her teaching methods combine the western knowledge of the body (anatomy, kinesiology & physiology) with the eastern tradition of yoga. Tiffany was previously the Acupuncturist & Yoga Teacher at the Nike World Headquarters in Portland, Oregon and has worked with over 25,000 patients. She has been a contributor to many major publications and has graced the cover of over a dozen magazines including: Prevention, Yoga Journal, Om Yoga Magazine, Mantra Yoga & Health Magazine, Origin Magazine, Thrive Magazine. Ujwal Bhole was a dear friend since the beginning of INNERCITYOGA. Among the first yoga masters we hosted at INNERCITYOGA, Sri Ujwal Bhole was a a teacher of yoga and also master of traditional dance Bharatanatyam. Son of the respected yoga expert Dr. Mukund V. Bhole, he studied yoga with his father and later on, in a famous centre Kaivaljadama in Lonvala, where he got a qualification of a yoga teacher. He studied dance from the childhood in Puna, later on from famous masters Padmashri Kanaka Rele in Mumbai and Padmashri A. K. Laxman in Madras. Author of dancing education programmes for hearing disabled children, Sri Ujwal Bhole founded his own dancing school in Lonavla called Nadabrahma Nrityala (The sound of dance and music is the supreme energy). In this school, students from India and abroad are trained regularly in both Bharatanatyam and Kathak dance styles, and can obtain B.C. in dance. The kathak continues to be taught by Sri Ujwal Bhole's wife, a graceful kathak dancer, Guru Sau Jyothi U. Bhole. We remember Ujwal as a warm-hearted friend, for his easy-going personality, his love for the best pizzas in Genève, astonishing us with learning to speak accent-free Italian in record time. We will never forget how he liked to take a nap in our sauna after travelling or his magnificent voice during the final chants of the yoga practice. In memoriam. 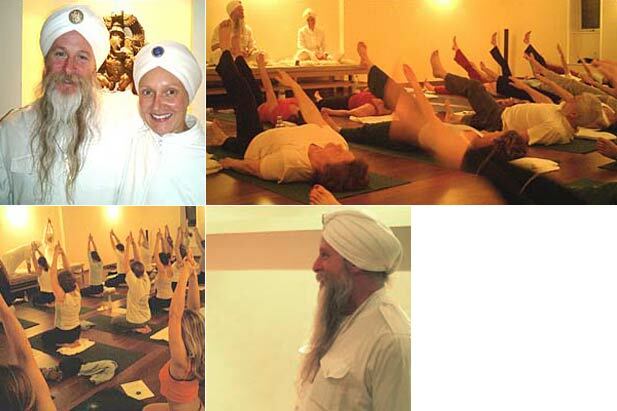 The late Dyal and Deva taught Kundalini yoga as taught by yogi Bhajan. Dyal worked closely with yogi Bhajan for the past twenty years and has particularly been involved in the training of teachers. In Kundalini yoga, postures are repeated up to several minutes, while using rapid diaphragmatic and long deep breathing in order to purify body and mind through kryias.